Thank you! I can’t wait to begin your tutorial. Your instructions are excellent! You’re very welcome, Mary Ann. I’m looking forward to seeing your project – and Erica’s too! Just purchased the only silk thread I could find in a 50w from Clover, the sateen cotton fabric and the water soluable thread. I’m concerned about tension issues and what I can find locally for the trap unto batting. I did find a lovely wool batting with high loft. What is your opinion? Thanks again! Hi Mary Ann, I’ll answer your last question first (because it is the easiest!). The wool batting will be fine for the Trapunto batting for this project, and you might use it for other trapunto projects. Use a thin cotton for the ‘sandwich’ batting (the idea is to make sure the Trapunto batting is higher loft and than the sandwich batting). 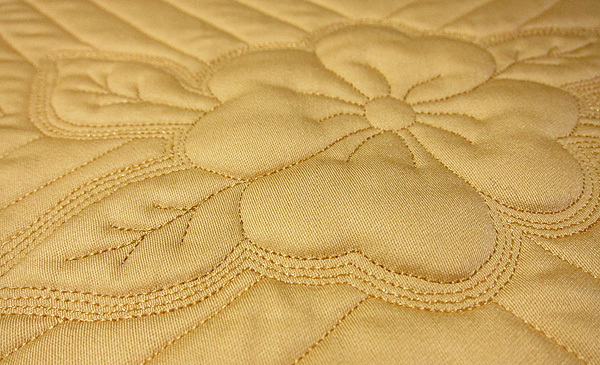 Regarding the silk thread, there are two reasons I love using silk thread: 1) it has a beautiful sheen that adds to the beauty of your quilting; and 2) #100 silk is very thin, and thin quilting thread is more “forgiving” as you quilt (for example, it will not build up or create a knot on the top of your quilt when you backtrack). I am familiar with the 50 weight silk thread and it is a beautiful thread. However, it will not be as forgiving as a lighter weight thread. Use a larger sewing machine needle – perhaps an 80/12 Microtex / sharp – with the #50 silk thread, and a similar color and weight cotton thread in the bobbin. Regarding tension, make a small practice sandwich with the exact same materials (top, batting, and backing). Use this to warm up your quilting and check the tension. If the bobbin thread pops up on top, reduce the top tension. If you see loops or bumps on the back, increase the top tension. Let me know how this works out – it’s different for every quilter and every machine. Using silk thread usually does require a small adjustment of the tension. Thanks for asking this question. I’ll post links to some online sellers of #100 silk thread. Great tutorial Diane! Thank you for sharing so generously all the tips and tricks you use on your own work. Good luck in Houston-look forward to seeing you there!